Each player’s board shows 5 areas each matching one of the main board’s 5 regions. If a player adds a card to their player board, they tuck it underneath the relevant region (leaving the info at the top showing) and then take a number of unification discs – 1 for the 1st card in that region, 2 for the 2nd, and 3 for the 3rd – and the colour of discs taken is determined by the colour of the card. Unification discs are important for earning bonuses at the end of each round. However, adding cards to a region increases unrest, and players will need to manage this because too much unrest means they may not be able to play further cards into that region, and/or can limit their court actions too. Add Officials (player board): Officials needed to hire workers and add governors. Move Officials (player board): Move officials around your player board. Hire Workers (player board): Add workers to a region (requires officials), but increases unrest. Add a Governor (main board region): Spend officials to place governor, earn bonus, majorities score VPs at game end, and reduces unrest in matching region on player’s board. 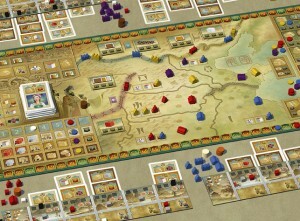 Build Wall (main board region): Spend 1-3 workers from player board and earn VPs at game end. Build Palace (main board region): Spend 3 workers, gain 3 unification discs, score VPs (equal to number of cards on player board). After executing a court action, the player may also get to use bonus abilities if the number on the card they played is higher or lower than the previous card on the discard pile. The action used determines if the number played needs to be higher or lower. If a player triggers their bonus abilities, players use all of those on the cards already added to their player board which show the matching court action (each card shows a court action and a bonus ability). This aspect is very interesting. Do you play a card for a court action right now when you’ll definitely get the bonus ability but the timing isn’t great, or wait for better timing but risk that you can’t trigger the bonus abilities. Also, which bonus abilities do you want on your player board? Which court actions do you want them to be triggered by, and do you want lots triggered by one court action, or one or two triggered by lots of different court actions? Also, do you use a card in your hand for its number or for the bonus ability (once added to your board)? I should point out that players draw 2 cards of each of the 3 colours each round, so they are guaranteed some spread of numbers on their cards. Also, players can see what colours of cards opponents hold, so they’ll have an idea what sort of numbers that might be on the discard pile later. At the end of each round, a bonus is available for each of the 3 colours of unification discs. The player with the most of a type can choose to discard all of their discs to receive the bonus offered that round for that colour, or they can pass (keeping their discs) and the same choice goes to the player with the next highest amount of discs. The bonuses for each colour and each round are different. Taking end of round bonuses also determines turn order for the next round too, so that may factor into your thinking about whether you should discard your discs for a bonus. After 5 rounds, players earn VPs for any of the 6 special objectives they have completed during the game (which are known from the start of the game). Players mark completed objectives straight away during the game – VPs reduce based on who completed it 1st, 2nd, 3rd. Plus, the objectives are split into 2 groups, and players multiply VPs earned for these objectives by the number of objectives in that group they have completed. For example, if you completed 2 out of 3 objectives in a group, then both of those objectives score 2x their value (and 3x if you completed all 3 in a group). So, aiming to complete a group of objectives will earn you more VPs. For some extra variety, the player boards all have a B-side too, which give slight differences (such as the amount of unrest allowed in each region, and a special ability). Each side-B is different too so each player has a slightly different view of the game. As you can probably tell from the description, ZhanGuo looks like it contains lots of elements that need balancing, which means lots and lots of decisions. Deciding which actions to take, and in what order, is just the very highest decision level and there seem to be plenty of decisions within that such as which cards to use where (discussed above), which objectives to aim for, which elements (like governors and walls) are other players looking to build (which may disrupt your plans), and so on. Everything in the game (apart from workers) is limited, including locations to place palaces, walls, etc. so this should add some extra tension too. For more Spiel 2014 previews, check out my Spiel 2014 Previews page which lists the games on my radar with links to their previews too. 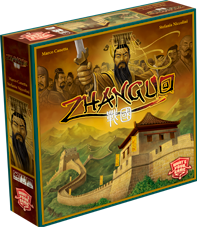 This entry was posted on Sunday, October 5th, 2014 at 1:32 pm	and is filed under Board Games, Essen Spiel 14, Preview, Spiel 2014, ZhanGuo. You can follow any responses to this entry through the RSS 2.0 feed. You can leave a response, or trackback from your own site.